Sep. 13, 2017 12:14 p.m.
Abbotsford South MLA Darryl Plecas is adamant that he never lied to his party. 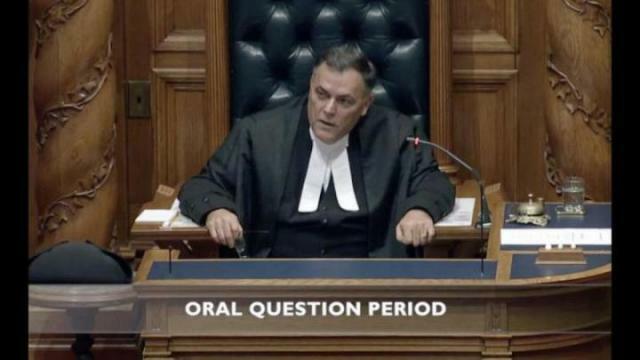 Plecas made waves last Friday by accepting an offer to sit in the non-partisan Speaker’s chair, prompting a furious reaction from Plecas’s own BC Liberals, which kicked the one-time star candidate from the party at the request of his own riding association. Speakers only vote in the case of a tie, which means Plecas’s decision will increase the NDP/Green partnership’s narrow margin in the legislature. After the move, BC Liberals, including party president Sharon White and interim leader Rich Coleman, said that Plecas had repeatedly promised to not sit as Speaker. Coleman labelled the move a “betrayal” of the party. In June, Plecas had told The News that it would be “dishonourable” and improper to accept the Speaker’s position. Plecas said Wednesday, though, that his thinking on the matter shifted after the Lieutenant Governor granted the Green and NDP party the opportunity to form government after Christy Clark’s throne speech had been defeated. Plecas said there was still the opportunity for him to stand in the legislature and say he wouldn’t sit as Speaker. But that he made no promises. Plecas said he is hurt that some would think otherwise. He said around 85 per cent of the feedback he has received since Friday has been positive. But he said the remaining 15 per cent, though, “is pretty horrible stuff,” with people calling him a traitor and a liar. He also said he worries that the idea that he lied will impact his new role as Speaker. Plecas also implied that some of the statements coming from his erstwhile colleagues may not be particularly heartfelt. Asked about the fact that his constituents elected a BC Liberal but are now represented by an independent, Plecas said he didn’t choose to leave the BC Liberal party, and that all MLAs have the opportunity to stand for Speaker. Plecas also said the pay bump that comes with the Speaker’s office had no bearing on his decision. As speaker, Plecas will make $150,000 a salary closer to that of a cabinet minister than a backbench MLA, whose pay starts at $105,881. He said if money was his chief concern, he wouldn’t have ran for office in the first place, and that as an MLA he has been making half of his previous salary as a tenured professor and part-time prison judge. As the dust settles, Plecas has begun sitting as Speaker and enforcing the rules of the legislature. And already he has had to clamp down on the political theatrics, telling BC Liberal Abbotsford West MLA Mike de Jong that he shouldn’t be using a prop in the legislature. He said his instinctual non-partisanship, which may have brought him trouble as an MLA, along with his time as a prison judge, will inform and aid his time as speaker. While questions have been raised about his ability to command the needed authority in the legislature with one side apparently harbouring some ill will, Plecas said he can do the job. Constituency work, he said, will continue, although the Speaker’s role means it will be different than for other MLAs. The Speaker’s office will have a staff member with the ability to raise issues of concern with Ministers, but Plecas won’t be doing that himself. The Speaker’s office has also been contacting reporters, telling them that Plecas won’t be engaging with the media during his time in the chair. That has been standard practice, albeit one applied flexibly, with Speakers addressing issues of mostly personal, rather than political, concern. Previous Liberal Speaker Linda Reid spoke to reporters about concerns about her spending, while her predecessor, Bill Barisoff, wrote weekly columns for his local paper and spoke about seismic concerns about the BC Legislature building, a matter that falls under the Speaker’s personal jurisdiction. Plecas said he will also have the opportunity to raise issues of personal concern to him, and that no longer being connected to a party might assist in that. “Being an independent makes it all so much easier,” he said. Plecas also said he is inclined to run again for office. That will be difficult – his predecessor John van Dongen was the area’s longtime MLA before he left the BC Liberals in 2012. A year later, Plecas easily defeated van Dongen. Throughout the half-hour interview, though, Plecas repeatedly returned to the notion that he lied to those in the party. And he concluded on that topic.